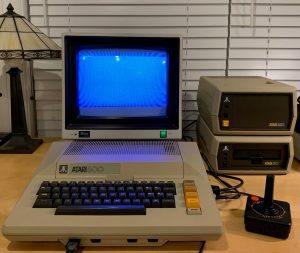 I never had an Atari 820 printer back in the day but have always wanted one because it beautifully matches the same style and color of the Atari 800 and 810 disk drive which is my preferred setup that I keep on my desk and use regularly. I recently picked up a lovely 820 for about $150 on eBay. It arrived in great condition with very little yellowing. So happy to have this! I have been shopping eBay daily for more than a year to find this gem. Thanks to the seller for getting it to me in one piece. Now that I have an 820 my next step was to find paper and ribbon for it. Fortunately, Best Electronics has both paper rolls and ink ribbons in stock. Unfortunately, you can only buy one at a time. I assume their stock is limited and dwindling fast. I paid $8 for the ribbon and $6 for the paper roll. Not too bad except they have a $50 minimum order so you have to purchase more stuff from them. I picked up a shrink-wrapped Moon Patrol cartridge which I didn’t have but you might not want to pay that much just to get ribbon and paper. Given the limitations of Best, I decided to look around to see if I could find the ribbon and paper elsewhere. I also posted on an Atari Age thread about this. This turned out to be a lot harder than I imagined. I am still searching for paper (more on that later) but I did manage to track down ribbons. 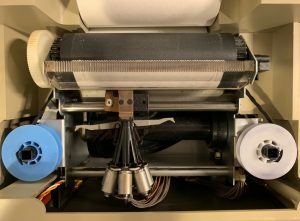 I found a company called Ribbons Unlimited that sells all kinds of old ribbons for retro printers. If you go to their Dot Matrix page there is a list of old printer makers that includes Atari. If you click on Atari they list ribbons for a few models including the 1025. However, the 820 was not listed. So, I emailed them what I was looking for and they were responsive and said they would look into it. Bingo! 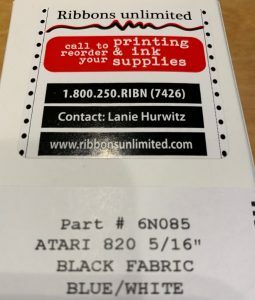 After a few days they emailed me with a new listing for Atari 820 5/16″ black ribbons! They sell them for $8.50 each which is just $0.50 more than Best and you can order as many as want. Problem solved. I have not yet found a good source of paper other than Best. I will post an update here if I track down paper rolls. 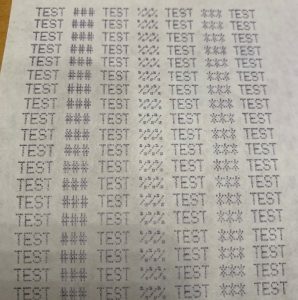 The problem is that much of what is available in the ~ 4″ width size is thermal paper. I am holding out for regular paper. I suppose thermal paper would work but I don’t really want the chemicals. Purchase a paper roll from Best Electronics for $6. Email them and indicate you want Atari 820 40 Column Printer Paper roll (CB101922). You will need to add to the list to make it at least $50. You can pay with Paypal. You can explore the Best printer site here. For the ribbon I recommend the one from Ribbons Unlimited. You can pay online with a credit card and order as many as you want. They are $8.50 each. Follow the instructions in the official Atari 820 Operators Manual.